System Block Diagram: The following system description makes frequent reference to the diagram shown at left. Click on the picture to see a large and legible system diagram in its own window. Note: The diagram and text in this section were last updated on February 4, 2012. Because I'm constantly changing stuff and (hopefully) improving the system, this section may not remain completely accurate for long. Computers & Software: The computer designated "PC-1" functions as the video stream server. It serves all the video streams using AbelCam Pro software, which directly handles Cameras 1 - 9 and indirectly handles Cameras 10 through AbelCam's Web Video and IP-PTZ capture interface. 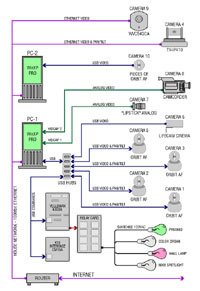 Camera 10 is physically connected to the computer labelled "PC-2" which is also running AbelCam to serve the Camera 10 stream across the LAN to PC-1. PC-2 also serves as the front-end web server; it has Apache + PHP installed on it. It would have been possible to run this entire site without Apache, since AbelCam has a fully capable webserver built in, but I eventually reached the point where I wanted the additional flexibility of big commercial webserver like Apache for reasons not directly related to the cam site. Camera 1 is a Logitech Orbit AF webcam with a built in motorized pan and tilt mechanism. 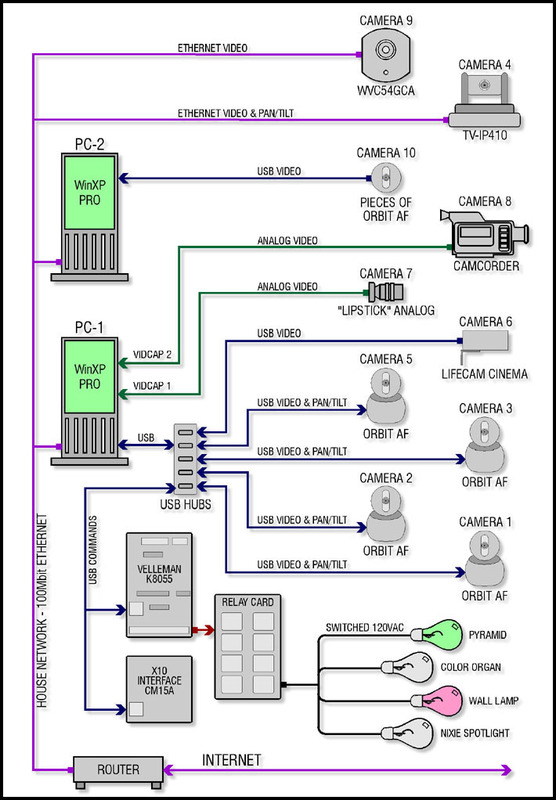 Video output to the computer is digital over USB. The USB interface also carries pan/tilt commands from the computer to the camera. I would say this is the best "cheap" camera I have (except that the auto-focus is a joke), but I can't recommend buying one. The product is fine, but in my opinion Logitech is not a good company to do business with. It's the kind of company that would rather threaten people (while hiding behind their lawyers) than engage in civil discussion. Assholes - avoid when possible. 'Nuff said. Camera 2 is also a Logitech Orbit AF. The Creative Live! Motion that used to be Camera 2 finally died. Since the Live! Motion is apparently no longer made I replaced it with an Orbit.